In Europe, Francoise would be likened to Garbo and Dietrich. In the U.S., Look magazine would feature a June 1965 spread on "The Sister Stars of France," spotlighting 'sweet' Catherine and 'soignee' Francoise. During the filming of The Young Girls of Rochefort in 1966, a reporter from L'Express sat down with Dorleac and Deneuve for an interview. Their affection for each other along with a playful competitiveness came through as the two, then 24 and 23, discussed their lives and careers. Francoise remarked on her desire to be less nervous before the camera, to stop "hiding behind" her hair; Catherine talked about feeling the need to be less stiff on camera. Francoise, who had so seriously pursued an acting career, seemed intent on becoming a great star. Catherine, who had not initially taken acting that seriously, seemed determined to become a better actress. The sisters seemed equally amused that while they were both extremely busy and making very good money, they were both also "broke." The two discussed their family resemblance and physical differences, with Catherine noting Francoise's gamine delicacy and Francoise commenting on her sister's "very sweet face." At the time, Catherine, who had already given birth to director Roger Vadim's son, was married to photographer David Bailey. Francoise's long engagement to actor/dancer Jean-Pierre Cassel (who would later recall his deep love and "terrible, destructive passion" for her) had finally come to an end. She and Truffaut had briefly been an item a few years earlier and she would be involved with high profile photographer's agent Albert Koski at the time of her death. As the interview wound down, the subject of youth and age came up. Francoise admitted that, at just 24, she didn't like to think about aging or mortality. She added, "I fear the end, I'm afraid of death." She would be lost the following summer, the victim of a fiery car crash near Nice in June 1967. Decades later a reporter would ask Catherine Deneuve what the low point of her life so far had been. She would pause and softly speak of the death of Francoise. She remembered her sister as a fine actress, a beautiful woman and "my closest friend." Francoise did not have enough time to achieve her dreams, but in the handful of films she completed during her lifetime lies tangible proof of her talent and her potential. Catherine did, as she hoped, become a better actress - and she became more than a star, she became a legend. A very nice birthday tribute to Francoise. I admit that I'm not all that familiar with French cinema but I did enjoy the info you've provided here and especially her lineage. She comes from a very gifted family. Thanks, Page. Of Francoise's films I've seen only "The Young Girls of Rochefort" and "Cul-de-sac" in their entirety. I've ordered "The Soft Skin" and may write about it. It was booed when screened at Cannes in 1964 but has since - as so often happens - been reevaluated and is much admired by many today. I also plan to get my hands on "That Man from Rio" and "Billion Dollar Brain." Francoise also appeared in "Genghis Khan" (1965) with Omar Sharif and James Mason, and "Where the Spies Are" (1965), a spy spoof with David Niven. Lady Eve - thank you for your very sensitive tribute to Francoise Dorleac - who Catherine considered the more beautiful of the two. It was so sad to lose her at such an early age. Those days were especially prone to having French drivers pretending to be at Le Mans while driving on narrow tree-lined country roads - with many tragedies. But now she lives on in her films. Christian, I did the best research I could without speaking French, so I appreciate very much that you enjoyed this piece. No one was more beautiful than Catherine Deneuve at her peak, but I believe had Francoise lived the two would've gone on being equally celebrated for both looks and talent. In her final film, Francoise was ultra-blonde and the color seemed to suit her as much as it does Catherine. 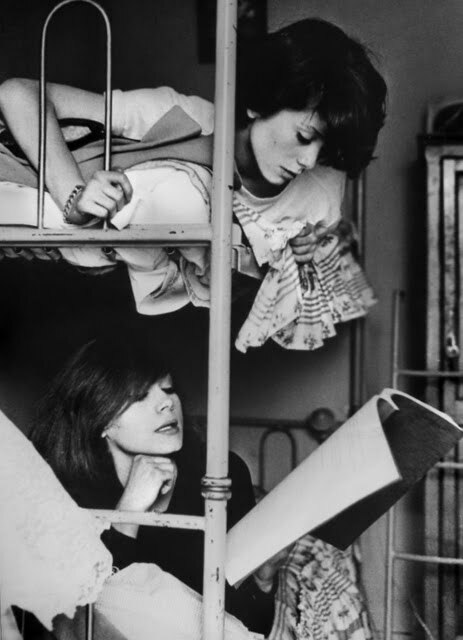 I have always wanted to see the film, The Young Girls of Rochefort. Thank you for your wonderful tribute to Francoise Dorleac. I will look for her films.. Dawn, Jacques Demy made "The Umbrellas of Cherbourg" with Catherine in 1964 and followed it with "The Young Girls of Rochefort" a few years later. "Rochefort" is a colorful and stylish treat - enhanced by the presence of Gene Kelly and Danielle Darrieux (who plays the mother of Francoise and Catherine). I hope you're able to see it soon. Wonderful tribute to Francoise. 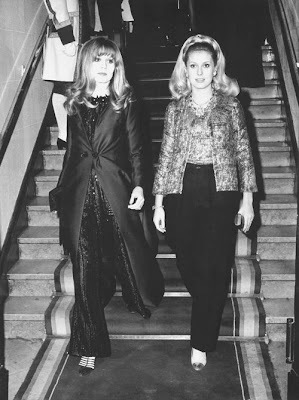 She and Catherine were so close that her death still haunts Deneuve today. For her, Francoise was the much gifted actress; yet, she is the one who is most regarded today. I expect she continued acting as a tribute to her sister, since she has so many other talents (most notably her painting). Again, I loved reading this! Thank you, Kim, I know you are a great fan of Catherine Deneuve. I can only imagine how difficult it must have been for her to go on after the loss of her sister. From what I've read, it seems she had become very committed to acting during the time not long before Francoise's death. Perhaps continuing as an actress helped her to go on and, as you say, made her feel she was doing something on behalf of her sister. It's as though Francoise's dreams were fulfilled by Catherine. Exquisitely. A very interesting read, Eve. I definitely would like to familiarize myself with Francoise's work - I've read about her but have only seen small fragments of her performances, as with the clips you included. Of course, she, like her sister, is very beautiful, but she has quite a distinctive and seductive voice, too. 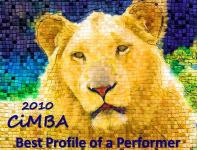 A strong vocal identity in an actor is very important and is something that sets them apart and leaves an impression. The french films of that era have such glamor - even without subtitles they're fun to watch. One can only imagine if both sisters had survived and had appeared in films together as they evolved through different periods of their lives, what shared characteristics and what differences would have emerged. Not to be too morbid, but death can appear at any time, it may be long off or just around the corner - a sense of mortality helps one appreciate art, as it does life. MCB, As I wrote this and then replied to comments, I avoided getting into "what might have been" for Francoise - on her own or in relation to her sister. Too much to imagine - she died so young and seemed to have so much ahead of her. I suspect she and Catherine would always have been "The Sister Stars of France." Both are very beautiful but are quite different - and very captivating - presences onscreen. How interesting it would have been to watch the two evolve over time. I have seen Dorleac in only two films (Cul-de-Sac and The Soft Skin) but I think she was just as talented as her sister. She died in a horrible way, very sad to say the least. I actually have a copy of BILLION DOLLAR BRAIN buried somewhere but have never watched it, though I am admittedly a fan of Ken Russell's visual style, and I have always wanted to see THAT MAN FROM RIO, but it's hard to find. Anyway, a very, very nice tribute to Ms. Dorleac. John, I haven't seen enough of "Billion Dollar Brain" to get a good sense of it - I know it wasn't as popular as "The Ipcress File" (not sure how "Funeral in Berlin" fared), but it is a Ken Russell film and the score is extraordinary - Plus Michael Caine, Francoise, Karl Malden and Oscar Homolka. If you find it and watch it, let me know what you think. Beautiful tribute, Lady Eve. I confess I find her the more intriguing of the sisters. So said that she left us so soon, but somewhat fitting for her mysterious legacy. I know little and less than that about Francois Dorleac. Enlightening post and a great tribute. Kudos! Thanks, Aurora. I just bought "The Soft Skin" and, through EBay, the LOOK magazine of June 1965 with the the layout on "The Sister Stars of France." That means there will be at least one more entry on Francoise Dorleac here. I was completely unfamiliar with Francoise Dorleac. So sad that she died at such a young age. This was a thoughtful post. Thanks for letting us know more about a talented woman. Ruth, I'm very happy to introduce you to Francoise Dorleac. I hope you have a chance to see a few of her films one day. I'm on a mission to find/watch as many as are available (in English or with subtitles). So happy to see something about this mysterious French star whose luster was lost too soon. Thanks for sharing this about her, Lady Eve...it was a sensitive and thoughtfully written tribute. Tres bien, ma belle! Thank you, Kay. 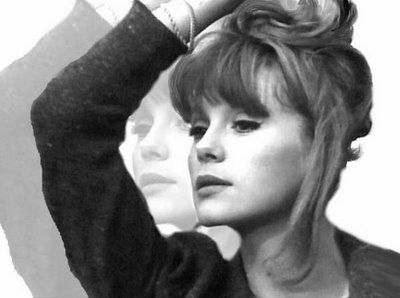 There will be more to come at this blog on the films of Francoise Dorleac. É triste pensar que a maioria só a conhece como a 'irmã mais velha de catherine deneuve'.